There’s nothing like feeling more organized and decluttered than to get things off the floor. Here are some inventive ways to do just that! Hang your automatically-sorted laundry above the washer instead of keeping hampers on the floor of your closet. Instead of the floor being your child’s toy chest, hang decorative baskets on the wall to hold toys, stuffed animals and books. Bicycles take up a lot of floor space – so hang them instead! Strap an extension cord to the leg of a table so the many plugs coming out of it don’t take up a whole foot of space. Plus, it looks so much neater. 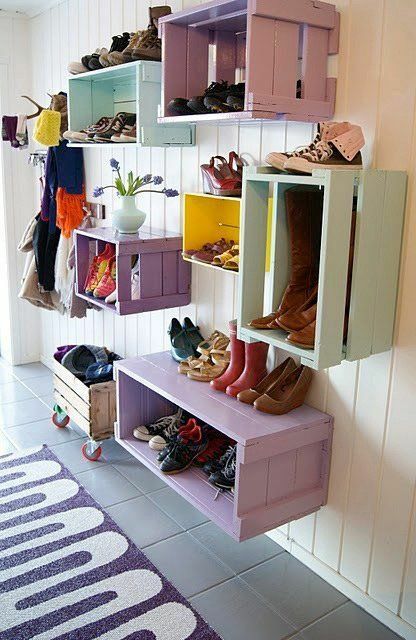 The entryway is one of the worst clutter offenders – so build hanging options for storing shoes, coats, backpacks, and more! This entry was posted in DIY and tagged DIY, organization, organize by Parks Realty. Bookmark the permalink.